Madge Sanchez submitted this photo and caption. 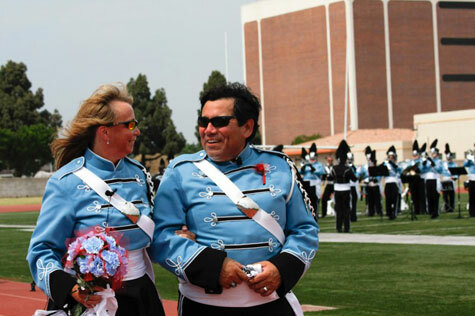 On July 11, 2008, Madge Johnson and Ray Sanchez, members of the 2007 Kingsmen Alumni Corps, were married. The ceremony took place on the 50-yard line at Veterans Stadium in Long Beach, Calif., the same stadium the corps used for rehearsals during the week leading up to their performance at the 2007 DCI World Championship Semifinals in Pasadena. The performers for the wedding included 25 horn players, 12 drummers, 12 color guard members, a five member National Squad, and three members of the Nicholson Pipes and Drums who brought the performers into the stadium to the strains of "Scotland the Brave." All of the performers and those in the wedding party, many who traveled from various parts of the country, were decked out in their cadet uniforms. The musicians performed "Somewhere," "One Hand, One Heart," and "Mambo," all from "West Side Story" in recognition of the fact that Madge originally marched as a member of the Velvet Knights and Ray with the Anaheim Kingsmen, one-time rival corps. It was a spectacular ceremony under beautiful blue skies made all the more special by the many friends and family who joined the happy couple to make this extraordinary dream wedding become a reality!